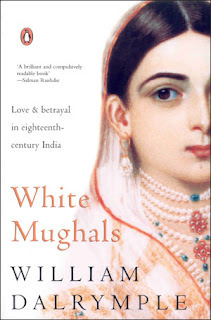 The true story of Captain James Achilles Kirkpatrick, who converted to Islam and married Khair-un-Nissa, a Hyderabadi noblewoman of royal Persian descent, is the most exciting of the three books I read, during this summer. I am sure this book will be made into a movie; by Bollywood, if not by Hollywood. This non-fiction historical narrative had a very special connection to me, perhaps, because of its setting. It is largely set in the city of Hyderabad in India, which is my hometown. And I had been to many of the palaces, forts and other landmarks on the Deccan Plateau, like Srirangatnam and Bidar, which the author describes. And I have decided to go back and see them again, now, with more knowledge of local history, thanks to this slightly voluminous, but very revealing book. The love story that unravels during 1798 to 1805 is not the only thing you will find interesting. The events that occur after their marriage, and the historical backdrop to the whole story will stimulate you more. Hyderabad’s Koti Residency (which is now Koti Women's College), on the banks of River Musi, is where James brings Khair-un-Nissa to live with him after their marriage. My friends from Hyderabad will know that the current name Koti (which means ‘mansion’) comes from this very place where the couple lived. But Khair-un-Nissa’s residence, before she moved to Koti, was near Charminar. And Purana pul was the bridge that connected the two places, over which her palanquin frequently traversed. River Musi, in those days, was a powerful river, causing hundreds of deaths by floods, during monsoons. As ‘British Resident’ in Hyderabad, James was, practically, the British ambassador to Nizam’s court, reporting to the Governor Generals heading British India; successively to Lord Cornwallis, Lord Shore and Lord Wellesley. He negotiated some very lucrative deals in favour of East India Company, like getting the Nizam to pay for British Regiments stationed in Hyderabad's outskirts (in the place we now call the cantonment area near Trimulgherry). James’ relationship with this young lady must have caused quite a stir and scandal because, soon, East India Company appoints a commission headed by the Governor of Madras, Edward Clive to look into the affair. Edward Clive, incidentally, is the son of the Sir Robert Clive, who with Warren Hastings was the first to establish political and military supremacy of ‘British India’ in 1757 after the Battle of Plassey. Strangely, Edward Clive’s commission’s findings do not implicate James. Based on James’ personality and on the fact that in a veiled society with strict Islamic traditions, they decide that it is impossible for James to have seen and seduced the girl, without her, and her immediate family's, active interest and consent. James must have so acculturated himself to the Hyderabad of those days – he is known to speak very good Persian, Urdu and Telugu - that this Nizam's Prime Minister’s grand niece’s choice of a British husband gets accepted by the Palace, even though with strong resistance from many quarters. The fact that Khair-un-Nissa was from the family of sayyids (direct descendants of Prophet Mohammed, with traceable ancestors from Persia) who do not allow mixed marriages with non-Muslims, this affair must have seemed completely outrageous then. But, it was not blown-up to a huge proportion. So, the writer suspects that the Hyderabadi Royal family of Nizam may have even willingly allowed this to happen; to keep James happy, and to keep British away from annexing Hyderabad into their empire. We see in this book, therefore, the real India of those times. We see here, the political manipulations that occurred between Indian Kings - particularly, the Nizam of Hyderabad, Tippu Sultan of Mysore, Peshwas and Scindias of Maratha regions – and the British East India Company and the leaders of French and Dutch colonies in India. The book clearly shows the enormous research done by its author. He must have looked painstakingly into the correspondence of those times; like that of East India Company with the Indian rulers, of Hyderabad’s Prime Ministers with James, of James with his family members in UK, and of the couple's children born with other friends and family. For the non-Hyderabadis, let me say this : Here, you will see that Napolean Bonaparte promised assistance to Tippu Sultan, in Tippu's fight against the British in India. Here, you will see an interesting meeting of James Kirkpatrick with Edward Starchey (grandfather of Lytton Starchey) at Hyderabad in 1790s. Here, you will see that the famous Thomas Carlyle, for a while, was completely enamoured by the beautiful daughter of the couple, Katherine Aurora "Kitty" Kirkpatrick in UK (She was originally named Noor un-Nissa, Sahib Begum when born somewhere near Charminar, but she took up the new name Kitty, after being shipped off to Britain as a child). Here, you will also see how Edward Clive, son of Robert Clive, investigates the scandal. Here, you will see how Lord Wellesley shows his cunningness in his correspondence with James. Here, you will also see how James' assistant cheats Khair-un-Nissa. For the Hyderabadis, let me say this: Here, you will find out about the Prime Minister on whose name Mir Alam mandi and Mir Alam tank are named. Here, you will find out why Maulali became famous. Here, you will find out which French General’s tomb is at Malakpet ( He was called Moosa Ram, and Moosa Ram bagh is named after him). Here, you will see how touring Persians described the Chowmohalla Palace (near Charminar) at that time. Here, you will see why the British Cantonments were stationed close to Nizam (in Trimulgherry). Here, you will see how the British developed a postal system between Hyderabad, Guntur, Vizianagaram and Machilipatnam, and also from Madras and Calcutta (Kolkata, now) with relays of horsemen. Also, you will see that the secrecy of correspondence was maintained because they used cipher. The book has intrigue and mystery, and keeps you wanting to know more. Of course, being historical, it is very slow and not action-packed but it has enough excitement in it, to sustain our interest. We will want to know what happened next, and where the couple's story is leading us to. More interesting are the foot notes and references. They are mind-boggling nuggets of historical information. This is an absolutely amazing book. Very thoroughly researched. The writer should be given (at least) three Ph Ds for this research! I never thought that a non-fiction book will hold me in its grip, like this one did for about a week. If you love reading Indian History, this is not a book to be missed. Blessing, thank you for the comment. Yes, I am sure the Hyderabadis in us cannot but relate to this amazing story. I am sure it will be a movie soon.